Welcome to Cafe Jazz, where we remain committed to providing the finest smooth jazz experience that we possibly can. Every presentation represents a journey of exploration. Watch for the signposts; they include stops with Joyce Cooling, Paolo, Victor Fields, and Eric Marienthal. Acoustic Alchemy, Gota, and Vince Mai provide some exciting detours. The trek continues with inspirational visits from Pieces of a Dream, The Rippingtons, and Monkey House while Shilts brings us halfway to a destination that shoots far beyond the ordinary! Music lovers everywhere are discovering Denver, Colorado native Vince Madison, a compelling composer, a dynamic arranger, and a consummate musician. Madison had played guitar for many years when at the age of 20 and already a university sophomore, he switched to piano after finding it better served his passion for composing. He went on to earn a degree in music composition, graduating with highest honours, and performed with Denver's #1 jazz group before relocating to New York City. There he furthered his instruction at Julliard while becoming immersed in the NYC studio scene, racking up credits with several major labels and with rap and R&B artists, such as Grand Master Flash. In the early 90s, Madison revealed another aspect of his multi-dimensional talents when he created a special concert for schools entitled Life Matters, designed to impart positive messages to young people. 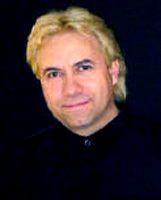 After performing the program throughout the Mid-west, he returned to Denver where his focus switched to works for solo piano. Madison released his well-received Nine Daughters debut in 1995, while Dreamland, which followed a few years later on his own Firefly Records label, set the direction that defined his style for the next several years. Half a dozen projects encompassing "Music for the New Era", culminated with 2004's best-selling Perfect Hearts. 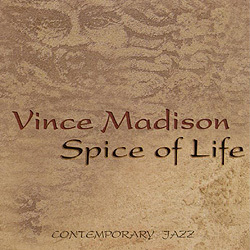 Yet, for his latest effort, Madison selected a different avenue choosing to return to his jazz roots with Spice of Life. Regardless of the genre, Madison's style and compositions have always reflected a philosophy, to make music for people who love music, an ideology that nicely meshes with our own; consequently, Spice of Life is a perfect choice for our showcase feature. Par for the course, we have a trio of selections that I know you're going to love. To launch the proceedings we're spinning Tangled Web, upon which Vince handles the guitar duties in addition to his keyboard work. The track Slow Dance elegantly opens the second half of the show; the trumpet of Eric Schneider lightly chills the selection while Marianna Madison's gorgeous vocals accentuate the melody! Finally, the apex of the album may well be our closer, a modern jazz classic called Saxy, with Jacob Teichrow's sax perfectly complementing the spark of Madison's keyboard groove. As good as they are, these tracks still provide only a small but exquisite taste of an album seasoned with variety and filled with exceptional moments! Although he's a full time radiation oncologist, William Woods has ample credentials having graduated from The Juilliard School of Music. 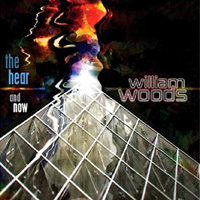 In 1997, he recorded his debut release entitled A Doctor's Dilemma, which generated sufficient interest to encourage Woods to pursue his passion. Subsequent efforts continued to expand on that solid foundation with The Hear and Now, Woods' just issued fourth release of original material setting a new standard of excellence for the Englewood, New Jersey native. Exhibiting a style that is simultaneously exhilarating and edgy, Woods continues to shine as both a musician and composer on this latest effort. Serving up a great mix of jazzy flavoured tunes, we've selected one of his finest! Hailing from Costa Rica and Iran respectively, the guitar duo of Jorge Strunz and Ardeshir Farah have been performing together for nearly 3 decades. Their meeting in 1979 signified the first occasion that the rich cultures of Latin America and the Middle East were united and in so doing a new and unique form of musical expression was created. Their style has been described as exotic and innovative. It's highly rhythmic, strongly improvisational, and requires the ultimate in proficiency. Following the release of their debut Mosaico in 1980, they've issued over a dozen albums with Fantaseo (pronounced Fan-ta-SAY-oh) as their latest. From that effort, we have the first single, an incredible piece called Azure! 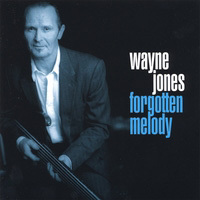 So what's all the buzz surrounding bassist Wayne Jones? One listen to the wonder from down under will answer that question. (Acknowledgement extended to Scott O'Brien at smoothjazz.com for the phrase.) Jones has been a fixture on the Australian session circuit for the last three decades. He's backed a diverse array of performers while earning credits for film and TV. He first entertained the idea of releasing a solo album around seven years ago, that has finally just come to fruition with the release of Forgotten Melody. Described as "a jazz tinged, funk and groove based feast" by Greg Phillips, editor of Australian Musician Magazine, Jones delivers a fantastic first effort that comes as one of the most pleasant surprises for the year! Bravo Mr. Jones! Trumpeter David Wells was born in Vienna, West Virginia, into musical family; however, early on, the Wells clan relocated to Dallas, Texas. Growing up with four sisters and two brothers, David and his siblings were encouraged to pursue their musical talents by their father, an ordained minister. As such, when Wells was drawn to the flugelhorn he set about to learn the instrument. By 14, he began dreaming about a career in music. He studied trumpet performance at Christ for the Nations Institute in Dallas, Texas and followed that with more sessions at Oral Roberts University in Tulsa, Oklahoma. Moving back to his hometown in the early 90s, Wells met his wife and continued to perform on a part-time basis. By the millennium, Wells felt the call to a full-time music ministry. 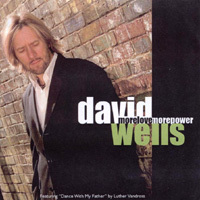 The result was his independently released debut record, subsequently he's issued five additional albums, More Love More Power being the most recent. From that effort we have the title track! 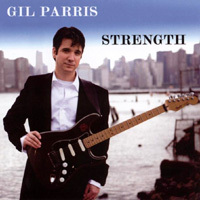 Gil Parris attended Berklee in Boston in late 80s on a Masters scholarship in jazz. Shortly after he was featured in a spotlight article in Guitar Player Magazine, wherein he was described as "the brightest new star in the genre since Larry Carlton". Gil's stint as lead guitarist for a later version of Blood, Sweat & Tears (circa 2003) was just one of many high water moments. His resume includes countless gigs as a sideman and record dates with the likes of David Sanborn, Bob James, Will Lee, Chuck Rainey, Will Lee, and Bakithi Kumalo. Grammy nominated, Parris seamlessly incorporates varying elements of funk, rock, jazz, blues into a signature style that is impossible to categorize and has developed into an accomplished performer in his own right; he's one of only a handful of artists to have released albums in four different genres. The latest release is Strength and from that effort, we're featuring the highly animated first single to radio, Jazz Night Out! This edition of After Hours is a two-hour special in two parts! Included in our line up are Michael Manson, Lee Ritenour, and Wayman Tisdale; also appearing are Peter White, Jeffery B Suttles, and Michael Franks. Featured for the first time are Ken Massey, Spur of the Moment, Dan Kusz, and Lafayette Harris Jr. We have the latest from Madeleine Peyroux, Jim Brickman, and Kirk Whalum. Not to be overlooked are selections from Greg Adams, Oli Silk, Wilton Felder, Jay Rowe, Briza, Tommy Emmanuel, and Chris Standring. In addition, Paul Lamoureux steps into the spotlight on Then & Now. Meanwhile, also featured is a 3 track medley by Alan Hewitt, exactly the way you'll hear it on Metropolis! Paul Lamoureux: A native of Edmonton, Alberta, sax and woodwind player Paul Lamoureux began his musical training with classical piano lessons at age 10. 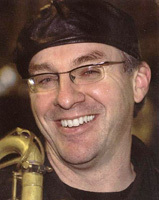 He took up the sax a few years later and added flute and clarinet to his repertoire while attending Grant MacEwan Community College. Upon earning a Diploma in Performing Arts, Lamoureux relocated to the US to continue his studies at North Texas State University. During his tenure at NTSU, Lamoureux worked cruise ships, played in big bands, and backed top name acts such as Robert Goulet and Mickey Rooney. He took a one-semester sabbatical to tour Western Europe with the New York Harlem Opera Ensemble, and upon his return, he graduated with a Masters in Music! He enjoyed a two-year stint at Opryland in Nashville and followed that with a 16-month gig at a resort in the Cayman Islands. In 1988, he did a bit of touring in the U.S. and Canada, before returning to Canada where he was in demand as a freelance musical director and music producer. In 1995, Lamoureux did some work for the TV series Jake & the Kid. That was sandwiched between two solo releases, Paul's self-titled debut in 1994, and then Scenario two years later. Soon after the release of Scenario, Lamoureux relocated to Toronto where he continues to be active as a bandleader, teacher, and producer while heading Lam-Chops Music Group, a recognized and trusted name in corporate musical entertainment. Just last year Paul released his third album, a unique project upon which he combined his love of smooth jazz with elements from the folk songs of his youth. So with a trio of releases now to his credit, that was all the prompting we needed to have Mr. Lamoureux as the focus for our feature. In order, the selections are One on One, Suave, and C'est l'aviron qui nous mene, the latter when loosely translated means "It is the oar which propels us." It's a short tale of a first date with a beautiful girl in a rowboat. This latest project definitely breaks new ground in smooth jazz with Lamoureux earning top grades for originality and creativity. Hopefully, we won't have to wait nearly so long for the next musical instalment from Canada's premier "pop" multi-reed instrumentalist!